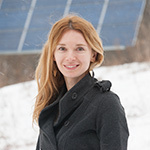 After earning a graduate degree in Diplomacy from Norwich University and gaining professional experience in the legal field, Olga comes to SunCommon with a desire to do her part in making it easy for Vermont businesses to go solar. She is extremely proud to be a member of the SunCommon family -Vermont’s ninth Benefit Corporation. She enjoys working with and learning from this great group of passionate and devoted colleagues. Since joining SunCommon back in 2014, Olga has been responsible for the coordination of resources needed to permit and install community solar and commercial projects. She manages investor relations, coordinates internal and external resources and assures that every commercial project meets SunCommon quality standards. When not at work, Olga enjoys spending time with her husband Sean and their young daughter Fayina biking, skiing and helping out with homework.